Here is a unique and spectacular spin on chili. One of my sisters was quick to tell me that I had to try it, and she was RIGHT (thanks Becca for the tip-off)! As soon as I looked up the recipe it was bookmarked for the future for various reasons. 1 – It’s a slow cooker meal and I love using my slow cooker on days when I know I’m not going to have time to make dinner. 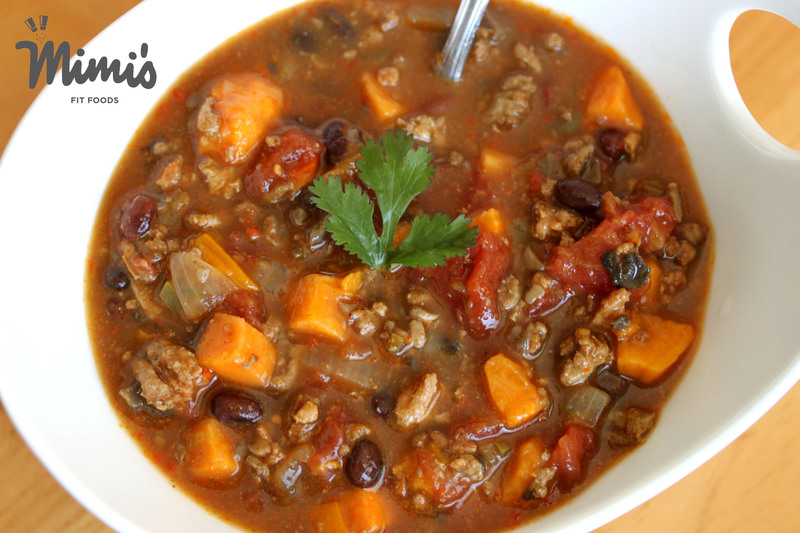 2 – It’s got black beans and sweet potatoes in it. A beautiful pair. 3 – It has interesting ingredients in it that caught my curiosity, but I could also visualize how they would all come together and work. Pumpkin puree, cocoa powder, and cinnamon . . . in chili? Yep! And, it works! Now, I’m not going to lead you astray here! It took me a little extra time than planned to get this in my slow cooker. I usually look at my slow cooker as a time saver, but it didn’t really play that role here. In this case, the slow cooker played the fantastic role of taking extra time to really help all these flavors meld together. I still had to cut up all the veggies, sauté the veggies, and then brown the meat . . . all before throwing it in the slow cooker. Here’s the thing. All those steps TOTALLY help to elevate the flavor, so don’t skip them. And, the extra steps made this chili SUPER awesome. All I’m saying is don’t get in the mind set that this is a meal that takes you all of five minutes to throw in the slow cooker and then dinner is ready in 6 hours. It’s going to take you a little bit to get it in the slow cooker (it took me about 35-40ish minutes), but then the slow cooker works its magic and you’ll be SO glad you made it. It makes A LOT. It freezes great, so I make the entire recipe and freeze half of it for later. You can also half the recipe and cook it in a smaller slow cooker. Or, you can invite friends/family over for dinner. You choose! That all being said, it’s really hard to EXACTLY describe the flavors. You just HAVE to make it. I will tell you this. I’m totally making it for the next chili cook-off and I’m pretty sure it’s a shoe-in for the blue ribbon. Heat a large skillet to medium-high heat. Add 1 teaspoon olive oil and add onion, garlic, bell pepper, and jalapenos. Saute for about 5 minutes, until veggies are tender and fragrant. Add to slow cooker. In same skillet, heat remaining 1 teaspoon olive oil. Add turkey and mushrooms and stir to combine. Sprinkle in cumin, salt, pepper, oregano, chili powder and smoked paprika. (note: the meat will taste very seasoned when done. Keep in mind these seasonings are not to flavor just the meat, they will season the entire pot of chili, so they are intentionally strong!) Add turkey mixture to slow cooker. Add sweet potatoes, tomatoes, beans, broth, pumpkin, cinnamon, and cocoa powder to slow cooker and stir til combine. Place lid on pot and cook for 4-6 hours on high, or 8-10 on low. Slow-cookers vary greatly in temperature and cooking times, but you’ll know it’s ready when the sweet potatoes are tender. When done, turn off heat and let chili sit with lid off for 10-15 minutes to thicken. Season with additional salt to taste before serving. If desired, serve with sour cream, sliced avocados, and a small squirt of fresh lime juice, and any other toppings desired.